As the 2018-2019 school year comes to a close, several scholarships related to Standardbred racing are now available to students. 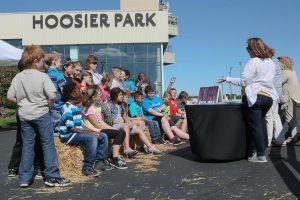 The Indiana Standardbred Association (ISA) and The Harness Horse Youth Foundation (HHYF) have several scholarships coming up, with the deadline quickly approaching for the two HHYF scholarships. Both are due by April 30, 2019. The $2,500 Curt Greene Memorial Scholarship is available for all students pursuing a racing-related career. The Sweet Karen Alumni Scholarship is available in various denominations and is available for students who have participated in a Harness Horse Youth Foundation Summer Camp or Family weekend. The ISA provides numerous scholarships each year and college assistance. Scholarships are available to ISA members or their children or grandchildren who are Indiana residents. Forms are now available at the organization’s Website at www.indianaharness.com. Scholarship applications are due by July 15, 2019. Other scholarships also open to any student associated with Standardbred racing includes the Christian Harness Horsemen’s Association Scholarships, totaling $5,000, the Harness Tracks of America Scholarship, which provides five worth $5,000 each for students active in some way in Standardbred racing, and the Jerome Hauck Scholarship worth $4,000 for students of full-time grooms or a child of a Harness Horseman International member. The deadline for all scholarships is April 30, 2019 except the Harness Tracks of America scholarships, which is due June 15, 2019 and the Hauck Scholarship, which is due May 1, 2019. For more information on scholarships or to obtain an application, go to the HHYF website at www.hhyf.org.